Kim? is honored to invite you to the artist’s talk by Finnish-Israeli artist Dafna Maimon who just opened her solo exhibition “Family Business: Power Failure”. The show at Kim? 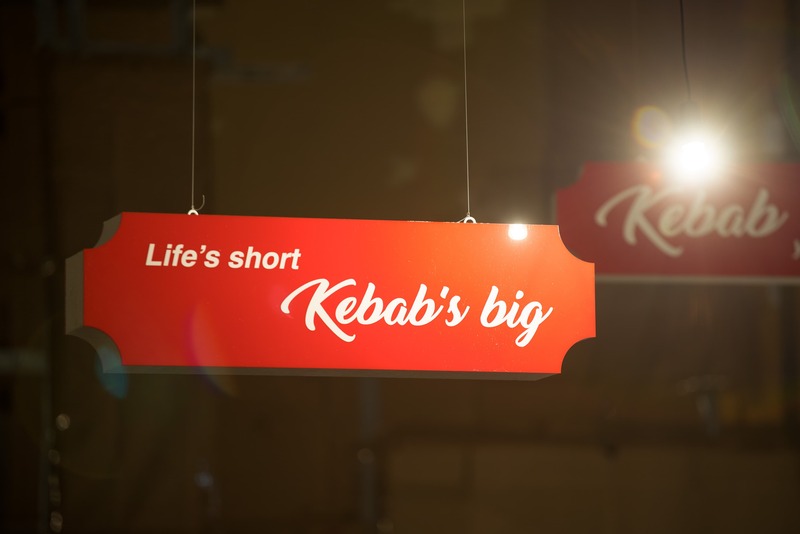 is the fourth in a series of exhibitions and performances inspired by autobiographical and micro historical research into a family-owned business – Finland’s first kebab and falafel restaurant Orient Express, which introduced Finns to the delicacies of the Middle East and was opened by the artist’s Israeli father in 1985. For Riga’s edition the artist is producing an onsite performative space generated by voices and memories about the roles of female family members and power dynamics that will include local stories and performers. The reconstructed “Orient Express” installation at Kim? will be activated weekly by a group of performers, or rather restaurant staff, who will take the function of the business into their own hands. In this rebellious and playful state of operation, the women’s past is reimagined and reenacted in liberating ways suggesting a future of new power dynamics to come. The artists’ talk will muse upon the processes in motion behind the previous chapters as well as its final culmination at KIM? Dafna Maimon works in video, performance and “immersive performance-installations”. Interested in directing an experience in a collective workshop-type of way, Maimon’s practice tests the limits of stereotypes while facilitating creative therapeutic techniques. Popular tongue and cheek definitions of identity and the body manifest themselves in her “amateur performance ensemble”’. Boundaries of the contemporary self are probed to allow for new ways of being. Dafna Maimon was born in Porvoo, Finland, and lives in Berlin. She has a bachelor’s degree from the Gerrit Rietveld Academy and a master’s degree from the Sandberg Institute. She has had residencies at: Künstlerhaus Bethanien, Berlin; Iaspis, Stockholm; Lower Manhattan Cultural Council, New York; and Skowhegan School of Painting and Sculpture, Maine, USA. Maimon has exhibited at venues including: Gallery Wedding, Berlin, Lilith Performance Studio, Malmö, Kunst-Werke, Berlin; Sinne Gallery and SIC Space, Helsinki; PS1 Moma, New York; Center for Contemporary Arts Ujazdowski Castle, Warsaw; NRW Forum, Düsseldorf, Moscow Museum of Modern Art; 1646 Den Haag; W139, Amsterdam; Annie Wharton Gallery, Los Angeles; and Project Native Informant, London.